Don’t be forgettin’ to talk to ye Cap’n. Have ye been gettin’ too soft on the shores? Git out there an’ Pray Like a Pirate! Too often we be too comfortable with the crosses we bear e’ry day. We git too lilly-livered and cowardly, stayin in waters we know to be safe. But yer Capt’n, the Christ Jesus, told ye to go out to all the world and preach ‘is good news. To serve the poor. To trust ‘im on the stormy seas of life. So muster up yer courage and ask yer Capt’n to push ye out to the depths, where thar be monsters, storms, and big beasties of life that ye need to trust ‘im, and not yer own strength. 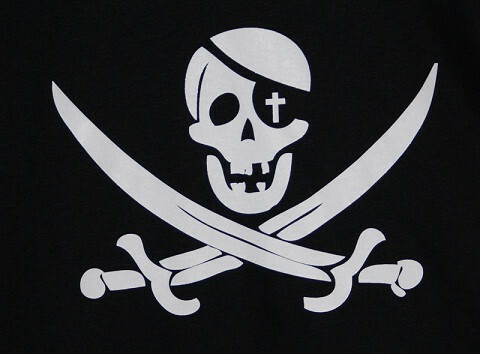 An’ fly the colors on yer gut with the Christian Pirate Shirt from Eternal Revolution.